While the politicians and representatives of the authorities are talking about a “quantum leap”, we will take to the streets on the 1. 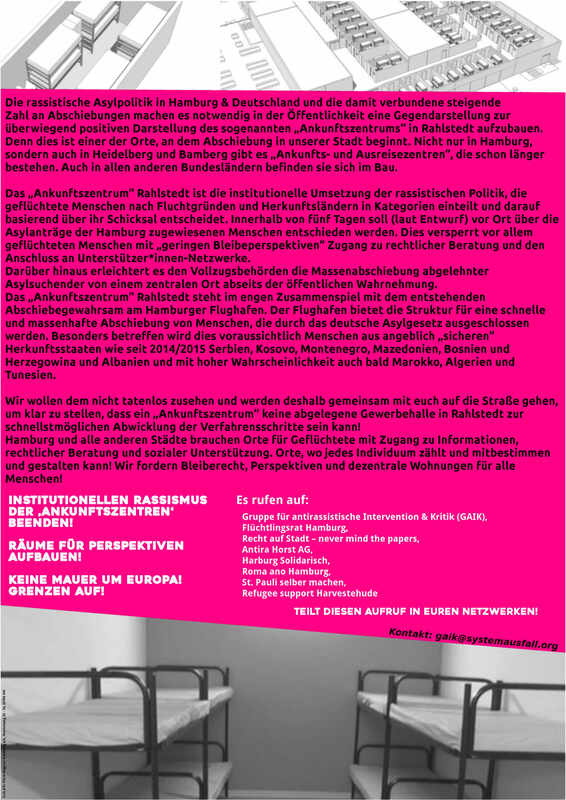 Oktober to expose what the so called “Ankunftszentrum” (reception center) truly stands for: the accelerated selective exclusion of refugees, isolation brought to perfection, and the means to deport people unnoticed and invisibly! The racist asylum policies in Hamburg and Germany and the connected growing number of deportations make it necessary to create a counterportrayal of the so called “Ankunftszentrum” (“reception center”) in Rahlstedt, because this is one of the places where deportation starts in our city. Not only in Hamburg but also in Heidelberg and Bamberg, there are “Ankunfts- und Ausreisezentren” (“reception and departure centers”), which were created a while ago. In other federal states, they will be built as well. The “Ankunftszentrum” Rahlstedt is the structural implementation of the racist policy which divides refugees up based on their reasons for fleeing and countries of origin and bases the decision on their fate upon these circumstances. The plan is that the asylum requests of people who were allocated to Hamburg will be processed within five days. Especially for refugees with “geringer Bleibeperspektive” (little perspective to stay), this blocks the access to legal advice and support groups. Furthermore, it facilitates the mass deportation of rejected refugees from one place far removed from the public eye for the authorities. Together with the “Abschiebegewahrsam” (deportation facility) at the Hamburg Airport, the “Ankunftszentrum” Rahlstedt provides the infrastructure for a quick mass deportation of people who are being excluded by the German asylum law. Especially affected by this will be people from so called “safe countries of origin” like, since 2014/2015, Serbia, Kosovo, Montenegro, Macedonia, Bosnia and Herzegovina and Albania and with a very high probability soon Morocco, Algeria and Tunisia will be added to this list as well. We don’t want to be passive bystanders, and therefore we want to take to the streets together with you to make it clear that a “Ankunftszentrum” cannot be a remote area in Rahlstedt with the main goal to speed up the asylum request procedure as much as possible! Hamburg and other cities need places for refugees with access to information, legal advice and social support. Places where every person counts and can participate! We demand a right to stay, perspectives and decentralized housing for everyone! 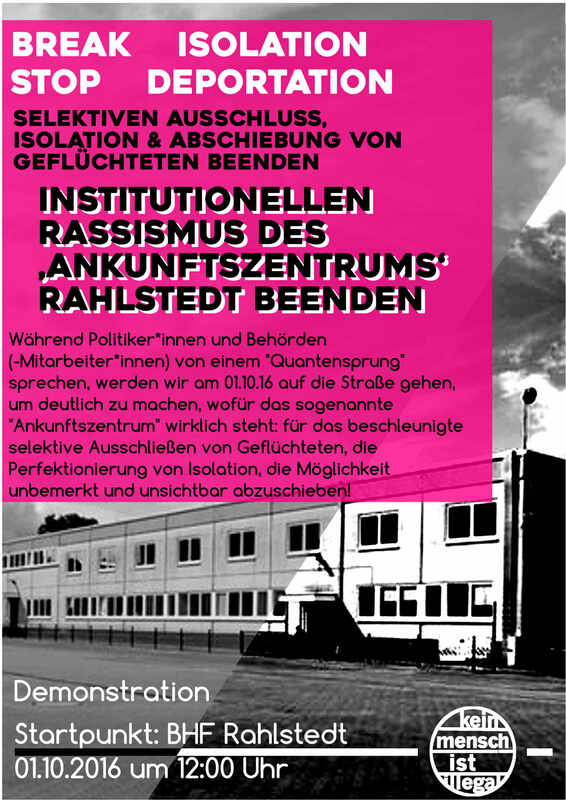 * End the institutional racism of the ‚Ankunftszentren‘! * No wall around Europe! Open the borders! Share this call in your networks!